Cora, you cannot always keep yourself away from the things that hurt you. We all wish that we could, but we cannot: to live at all is to be bruised. Something sinister stirs in the marshes along the Essex coast. Hysteria ripples through the village of Aldwinter in dread of it. It's a serpent-monster, they say - a winged leviathan that once roamed this county just north of London more than three hundred years ago. And it's come back to steal the breath of children and the reason of adults. 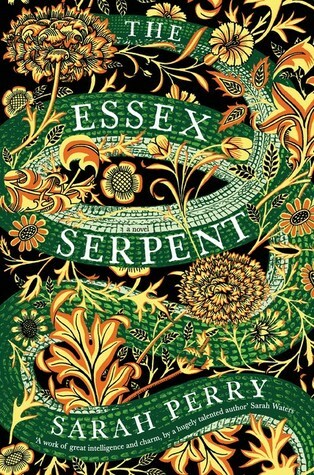 Sarah Perry's lush, complex historical novel, The Essex Serpent, is a marvel of storytelling, research, and insight into the nature of love. Set during the peak of Victorian England, the novel celebrates an era that has long been characterized as stifled by convention and rigid biblical conservatism. Perry shows instead a time of great scientific curiosity, an embrace of research and experiential learning, and an emboldened sense of social justice. The author offers us strong women who loosen their corsets to better tramp through fields and marshes, exploring a life of the mind and burgeoning modernity. She deftly combines a Gothic style of prose with clear-headed emotional arcs for the broad and fascinating cast of characters. The story's heart and soul belong to Cora Seaborne, a young widow who wasn't sorry to see her abusive husband pass. She escapes the confines of mourning in London for the freedom of the country, accompanied by her companion, the stalwart Martha, and her autistic son, Francis. Cora is an amateur naturalist and without knowing it, a feminist—a woman wholly unafraid to live her own truth. Or at the very least, to work to explore and define what that truth may be and what it holds for her future. This is also a novel of tangled, rich love, both mannered and wild. Multiple hearts beat with loves unrequited and an aching pervades the pages, expressed in letters, in long glances, in touches to cinched waistlines and damp napes of the neck. Along with the palpable sense of dread that follows rumors of a winged beast is a sense of desperation and longing that may spin out of control at any moment: desire without fulfillment can be as dangerous as a legendary ichthyosaur. This is as lovely a novel as I have read in a long time, reminiscent of A.S. Byatt and Sarah Waters. Sarah Perry is a breathtaking writer. Settle in and be prepared to be swept away on a wave of exquisite prose and storytelling. Highly recommended. Sign into Goodreads to see if any of your friends have read The Essex Serpent. 23.93% "Much later each claimed to have seen a curious thickening and rising of the water in a particular place, just where the salt marsh ended and the riverbed shelved steeply down." 39.1% ""You are a solipsist, Mrs. Seaborne—can you really not imagine that I might take a path which differs from yours and be happy walking there?"" This sounds like an interesting book. I'm going to put it on my TBR list. Nice review, Julie! This definitely piqued my interest! Lucinda wrote: "This sounds like an interesting book. I'm going to put it on my TBR list." Suzanne wrote: "Nice review, Julie! This definitely piqued my interest!" YAY! I loved this. It took me awhile to read because of life getting in the way, but really, I didn't want to put it down. Great review, Julie, I am reading it now and am enjoying it. Awesome review Julie! On my list! Dianne wrote: "Great review, Julie, I am reading it now and am enjoying it." Isn't it lovely? I didn't do it justice, for sure. Karen wrote: "Awesome review Julie! On my list!" Lovely review, Julie. I'll have to find the time to read this--everyone loves it. Connie wrote: "Lovely review, Julie. I'll have to find the time to read this--everyone loves it." Great review, Julie. I enjoyed this book tremendously.